Good Morning to you ladies! I hope you have a spectacular day! Today I have 2 challenges, the other one will post later so I hope you come back to visit, please! This first one is Divas By Design Challenge Weddings and Anniversaries. I decided to make a old vintage looking post card for either a Anniversary or Wedding with my LOTV image. The papers are from Teresa Collins 'Far Away" line. The post card was right in the middle of the page just staring at me, all I did was cut and distress. Here are some Prima embellishments and a crocheted doily to dress it up with. My friend Lisa always has tutorials and this one fit the mood I wanted to create, I cracked the paper. I used clear embossing powder and versa mark to emboss 4 times over this image and the round sentiment. After embossing I put it in my freezer for 1 hour and after removing it from the freezer I immediately started to gently crack it. Then I rubbed distressed ink 'Vintage Photo' all around the image to fill in the cracks. Thank you Lisa for doing this on your card recently!! My image is raised up a bit on dimensional dots from SU and then I glued a row of beads around my Wedding Couple. Here is the cracked sentiment I made. This is also a LOTV product. I am loving their new grunge line. Thank you so much for visiting with me today, wish you all a lovely day! 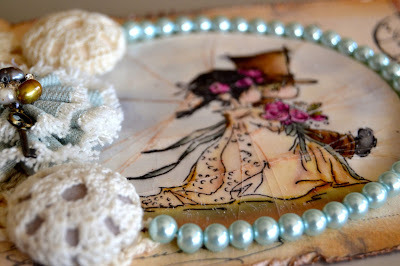 Hi Kelly, I love how you aged your postcard and I love this image, gorgeous embellishments too. Fabulous vintage look and I like it a lot. Even the crocheted buttons are a great 'old' embellie for this. Also one of my fave LOTV images and it looks great with the cracked glass technique! Oh wow just love your technique of cracked paper, excellent job ! Your card is beautiful ! Oh Wow! this is really beautiful Kelly… I love the image with the cracked effect and the pretty pearls around… the whole postcard has a lovely vintage feel… the embellishments are exquisite.. so many lovely little details !! I think this is one of my favorites Kelly - in fact I know it is. Beautifully made Kelly and thanks Lisa for your tutorial! Oh, how sweet, Kelly... the antiquing on the postcard is brilliant, and the cracked look across the image is amazingly cool. I adore this vintage creation....what a great idea to fill in the cracks with vintage photo ink!!!!! Love the look!!! Of course, the embellishments are perfection.....outstanding work, my friend! Hello Dear Kelly, I love your vintage wedding card! love the postcard in the background, love those pretty flowers and all embellies, that is to say I love it all! fabulous crackled glass effect. Absolutely Wonderful! Hugs. Totally in love with this card!!! Love the cracked look! Great colors and embellishments too! All beautiful!